The lobby of the College of Theology’s new home, Howerton Hall. Tom Tanner has visited the Grand Canyon University campus four times. One of the building blocks, in a figurative sense, has been Grand Canyon Theological Seminary. 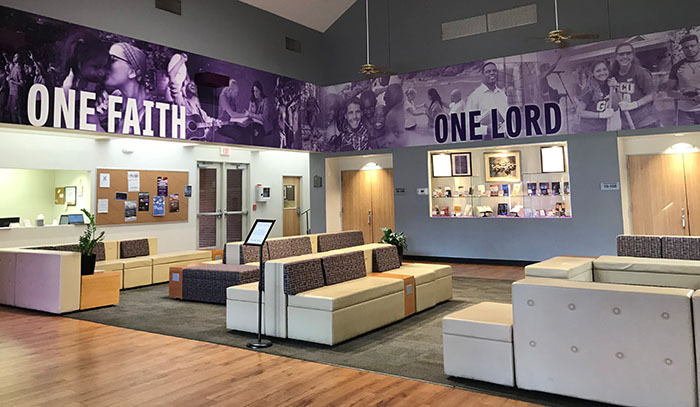 A month before it opened in August 2016, it earned associate status from Tanner’s accrediting organization, the Association of Theological Schools. But the Seminary recently was deemed worthy by the ATS of a much more important milestone: full accreditation for seven years. That means it is one of more than 270 ATS members – and Tanner, a Director of Accreditation for ATS, said the October site visit was an eye-opener for all five members of his team. 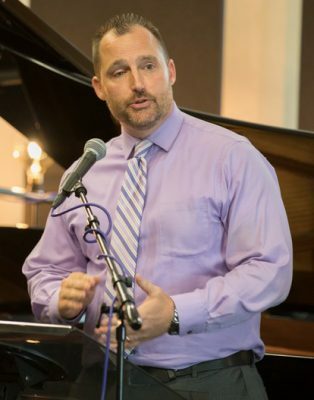 College of Theology Dean Dr. Jason Hiles. The reputation of ATS shines equally bright. The approved degree programs are Master of Divinity, Master of Arts in Christian Leadership, Master of Arts in Christian Ministry, Master of Arts in Youth and Family Ministry, and Master of Arts in Urban Ministry. GCU first applied for ATS associate membership in 2015, a year before the Seminary was born. That was a leap of faith for the accrediting body, as GCU was still in the process of reverting back to its nonprofit status – which was approved in July 2018. The process gained even more steam when Dr. Peter Anderson was hired as an assistant dean and put in charge of the Seminary last year. Anderson said it was a key topic of the interview process, and he hit the ground sprinting, not just running, as soon as he arrived on campus. That’s where other University departments came in. The self-study document alone was 150 pages, with about 2,000 accompanying pages. “It felt like another dissertation,” Hiles said. Anderson, who has gone through the same process at other institutions, was stunned by the amount of support. Tanner and the other ATS representatives, some of whom are administrators at other colleges, met with alumni, students, advisory board, faculty and the University administration to review the programs. Hiles emphasized that ATS accreditation isn’t just a gold star for the Seminary. “When the ATS team members come and are looking under the hood in trying to figure out who we are, they’re not just looking at the Seminary,” he said. “They are trying to understand organizationally who we are as a Christian institution that supports nearly 100,000 students. What’s next? Now that the Seminary is a full ATS member, Hiles and his team can utilize all of its services, which include annual meetings and workshops, research into theological issues, assessment of student learning, training materials, counseling and coaching. And then there are the accreditation visits, which means Hiles is eligible for a new responsibility. “They’ve already told us they’re going to begin to invite us to participate in other site visits,” he said. That’s another way of setting a gold standard. Wow! This is so cool. I just completed my first week of the Master’s of Arts in Christian Ministry degree program and so glad to learn that it is one of the approved programs. Dr. Scott Hovater is my instructor, and he is a real blessing! So proud to be a graduate of this school. Congratulations, Dr. Hiles and the entire GCTS team. You’ve worked very hard for this! Well done! Awesome! I will share this information with some future theology students. I am in the MDiv now and look forward to graduating in a little less than two years. God Bless you all for your amazing perseverance in seeing this wonderful project through. Fantastic news! I’m blessed to be a GCU graduate. Keep up the great work and great course offerings. What a awesome blessing!! I recently graduated from GCU with a Masters Degree in Christian Leadership. I feel so good hearing this great news.